After all I'd heard about the Fat Duck, and with all the anticipation of having a dinner there (it has a three month waiting list), when we finally arrived, I was a bit underwhelmed by its nondescript location. Situated in Bray, a tiny little village outside of London, it really is in the middle of nowhere. Even when you get to the restaurant, the only clue to its presence is Heston Blumenthal's signature logo outside; three utensils cleverly doubling as parts of a duck's anatomy. 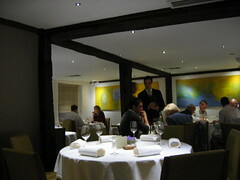 The interior, too, is very unassuming, for a restaurant that has the reputation of being the second best in the world. The lighting is perfect, and the tables impeccably laid. Strangely there are too many waiters - though this may be because a name like Blumenthal's attracts so much free labour. 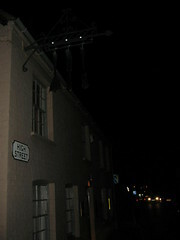 The Fat Duck is one of the bastions of molecular gastronomy, and the amuse-bouche certainly reinforced that. 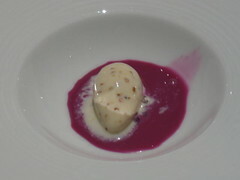 A pomery mustard ice-cream with a red cabbage gazpacho, this was an unsual combination, to say the least. However, it was not unenjoyable - the mustard ice-cream was subtly piquant; refreshing in its mild pepperiness, its slight headiness and icy creaminess. The red cabbage gazpacho was strangely sourish, which went well with the ice-cream, but was a little too tart to enjoy on its own. 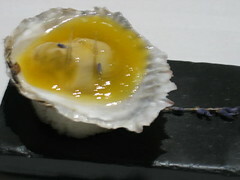 Our second palate-teaser was a fresh oyster served with passionfruit jelly. I felt this was slightly too exotic a pairing, with the flavour of the passionfruit overwhelming the delicate taste and texture of the oyster. I started with a cauliflower risotto, served with a carpaccio of cauliflower and chocolate jelly, dusted with cocoa powder. 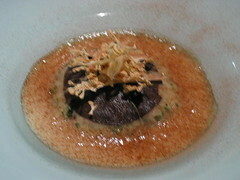 I was really surprised with this dish, closely related as it is to Jamie Oliver's chocolate risotto. The risotto was perfectly creamy, with the blandness of cauliflower, offset by the sweetness of the chocolate and cocoa powder. The cauliflower carpaccio (really just very crispy roasted shavings of cauliflower), while repetitive, added a contrasting and welcome texture. 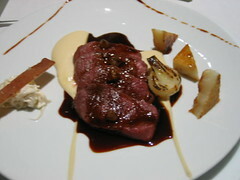 My main course took the form of a saddle of venison, served with celeriac puree, marron glacé and sauce poivrade. It also came with a civet of venison with pearl barley and red wine. 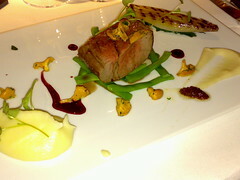 The venison was quite excellent, a perfectly-executed combination of flavours and a riot of colours to boot. 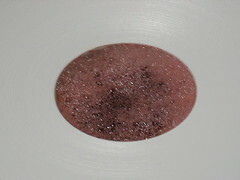 The pearl barley and civet were a deft touch; the barley sweetening and attenuating the sharpness of the red wine, as well as providing additional liquid for the sauce in the main dish. At this point we were presented with further examples of why the Fat Duck deserved its reputation for culinary alchemy - a carrot-orange lollipop and some beet jelly sweets. 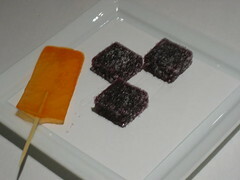 The sweets tasted almost like those blackcurrant pastilles I enjoyed very much in my youth, and the carrot lollipop is surely a good way to get children to eat their vegetables. My meal ended with a chocolate fondant with cardamom, dried apricot yoghurt and harissa ice-cream. 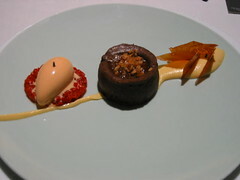 While the chocolate fondant was intense and exquisite, I did think the use of harissa was a bit too extreme. 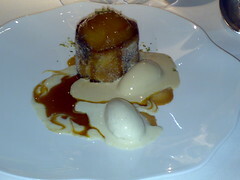 The heat spread quickly through my mouth like wildfire, and made it difficult to enjoy the rest of the dessert. Too strong for me, I had to leave the harissa to the side. While I appreciated the obvious thought and effort that had gone into the creation of every dish, I did think that molecular gastronomy was more gimmicky than more conventional cooking, but who is to say where cooking ends and science begins? I applaud Heston Blumenthal for pushing the limits of culinary possibility, and the Fat Duck is a restaurant to be enjoyed, rather like a work of art, out of deference to its creator. On one level, starting university on the other side of the world puts a bit of a dampener on the running of a food blog, especially if good food is somewhat limited in your particular location. Still, there are glimmers of salvation. Not too far from Oxford is one such glimmer, in the form of Raymond Blanc's Le Manoir Aux Quat'Saisons, a restaurant famed for its usage of organic produce, much of which is grown on site in the two-acre vegetable and herb gardens. Being a highly-recommended Relais & Chateaux hotel-restaurant, we took our seats at the dinner tables of the Manoir with great expectations. 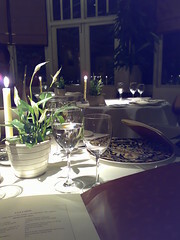 The restaurant is a lovely place to come for a meal, whether at dinner or lunch. Naturally if you come in the afternoon in summer, you'll be able to see the gardens in all their splendid lushness. 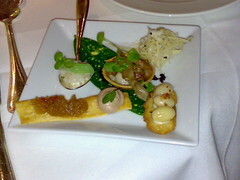 We started with an amuse-bouche that, oddly enough, came only on two plates, which meant we had to share. Decidedly artisanal and wonderfully refreshing, this set the tone for the meal to follow. As we had the menu classique, there was no need to choose; instead we were treated to the best-loved dishes of Le Manoir. 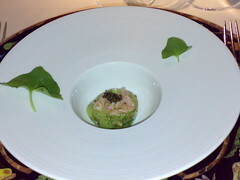 The first was a fresh tartare of salmon, wasabi and cucumber, topped with Oscietra caviar. I really enjoyed this, despite not usually liking salmon tartare. All the ingredients were so robustly fresh and bursting with flavour that it was really difficult not to inhale this dish. The cucumber, in particular, was very interesting; firm and juicy, it was nonethless soft and pliable enough to be wrapped around the entire starter. 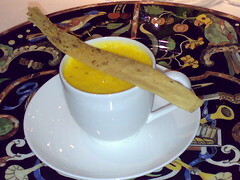 As an alternative starter, my parents had a pumpkin soup, which, though it seems unexciting, was executed perfectly. The sweetness of the pumpkin really shone through, the cappuccino foam adding to the lightness of the otherwise full-bodied soup. Following that, was a risotto of new season pumpkin and chestnuts with wild mushrooms, topped with a quenelle of mascarpone and toasted pumpkin seeds. This was one of my favourite dishes; I really loved the golden hues of the risotto, contrasted with the reds, greens and whites on top of it. 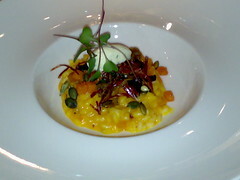 Creamy and sweet, the risotto was perfect, with the crunchy pumpkin seeds providing a contrast of texture and taste. Next came the pan-fried Icelandic halibut with citrus fregola, scallops and lemongrass braisage, on a light bed of lentils. 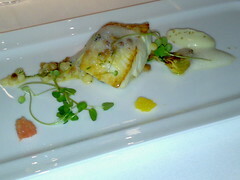 I'm not a great fish-lover, but I did like the use of lemongrass and citrus to lift the dish to some unusual heights. We then had the meat course - a roasted fillet of Angus beef, served with Girolles mushrooms and shallot and celeriac purees. The filet was a little firmer than I expected, but extremely flavourful and well-complemented by the smooth, creamy purees. The only dish I didn't really enjoy, the pan-fried apricots in nougatine and poached meringues served with Kirsch vanilla cream was too sweet for me, which was strange since I enjoy much sweeter foods than my family, all of whom polished off the dessert. 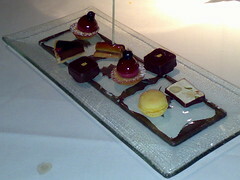 What I did enjoy were the petits fours and chocolates at the end of the meal, as well as the guided tour of Le Manoir's kitchen before that (suggested by the waitress when she heard I was a food blogger). Service was generally excellent, and the food, with its strong emphasis on organic produce and full flavours, was quite exceptional.